Kath joined UNE in 2012 after obtaining her PhD and MSc in Sports Biomechanics at the University of Chichester in the UK. Kath's main research areas stem from her background as a podiatrist where she is interested in lower limb biomechanics and understanding the pathomechanics of sports injuries. 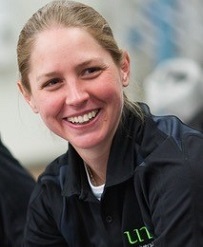 In addition to research, Kath looks to practically apply her knowledge through providing sport science support to professional athletes and clubs, which has included Sussex and Hampshire County Cricket Clubs in the UK and she will be hoping to pursue similar links with sporting groups in the local community. Lake J., Lauder M., Smith N. and Shorter K.,A comparison of ballistic and non-ballistic lower body resistance exercise, Journal of Applied Biomechanics, 28(4), 431-417, 2012. Lake J., Carden P. and Shorter K.,Wearing knee wraps affects mechanical output and performance characteristics of back squat exercise, Journal of Strength and Conditioning Research, 26(10), 2844-2849, 2012. Shorter K.,Lake J., Smith N. and Lauder M., Influence of the foot-floor interface on squatting performance, Accepted for publication in the Proceedings of the XXIX International Conference on Biomechanics in Sport, University of Porto, Porto, Portugal, 2011. Shorter K.,Nealon A., Smith N. and Lauder M., Cricket side strain injuries: A description of trunk muscle activity and the potential influence of bowling technique, Accepted for publication in the Proceedings of the XXIX International Conference on Biomechanics in Sport, University of Porto, Porto, Portugal, 2011. Shorter K.,Lake J., Smith N. and Lauder M., Acromion cluster reliability under dynamic loading conditions, In Proceedings of the 8th International Shoulder Group Conference, University of Minnesota, USA, pp. 75-76, 2010. Shorter K.,Smith N., Lauder M. and Khoury P., A preliminary electromyographic investigation into shoulder muscle activity in cricket seam bowling. In Jensen R., Ebben W., Petushek C R. and Roemer, K (Ed. ), Proceedings of the XXVIII International Conference on Biomechanics in Sport, Northern Michigan University, Michigan, USA, pp. 608-611, 2010. Shorter K.,Smith N. and Lauder M., Ankle joint loading during the delivery stride in cricket medium-fast bowling, In Anderson R., Harris D. and Kenny I. (Ed. ), Proceedings of the XXVII International Conference on Biomechanics in Sports. University of Limerick, Limerick, Ireland, pp. 677-680, 2009.